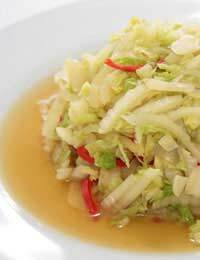 Forget over-cooked anaemic cabbage! Chinese vegetable cooking results in a dish that is colourful, tasty and healthy! Now what more could you want? Don't use frozen veg as it contains too much water. Heat a small drop of oil in the wok. Add the prepared vegetables and shake to give them all a coating of oil. Add a little water - unless you're cooking a leafy vegetable as that will contain enough water of its own - and put on the lid. Leave to steam for a few minutes. Don't leave it too long as you want your vegetables to retain all their goodness and colour as well as flavour. After steaming, if you wish, you may add some sauce and heat through before serving. Otherwise serve immediately. If you'd prefer something a little saucier, try one of these recipes. Heat the oil in a wok. Stir fry the chillies and pepper for 1 minute. Add the cabbage and continue to stir fry for another 2 minutes. Add the soy sauce, vinegar, sugar, water and salt and continue stirring for another minute. Sprinkle with a few drops of sesame oil before serving. Place the stock in a saucepan and bring to the boil. Add the green beans and simmer, stirring, until nearly all the liquid has evaporated. Remove from the heat. Heat the oil and butter in the wok. Add the garlic, spring onions and salt and fry for 1 minute. Add the beans, mixing them in so they're well-coated with oil. Add the soy sauce, sugar and sherry and stir fry for 1 minute. Serve immediately. Only a small proportion of the general population of China is vegetarian although vegetarianism is practised by Chinese Buddhists, and has been for many hundreds of years. Along with simple - and more complicated - vegetable dishes, bean curd (tofu) is a staple of the vegetarian diet in China. Made from soybeans, tofu contains no cholesterol and is low in fat. This highly nutritious little gem, which is believed to have been made in China as long ago as 100BC, is packed full of all the things that are good for the human body. On its own, it's bland but with the right marinade it can add just what's needed to a vegetarian dish. Mix all of the marinade ingredients together and spread over the tofu in a dish. Leave to marinate for an hour or preferably overnight. Heat some oil in a wok and fry the bean curd turning once and cooking until it is golden-brown. Remove from the pan and leave on kitchen towel to draw out the excess oil. If there's any oil left in the wok tip it out before adding the stock, soy sauce, tomato puree and vinegar. Bring to the boil and add the cornflour paste. Simmer until the sauce thickens and clears. Return the bean curd to the pan with the sesame oil and a sprinkling of freshly ground black pepper. Heat through. Serve garnished with cucumber and spring onions.